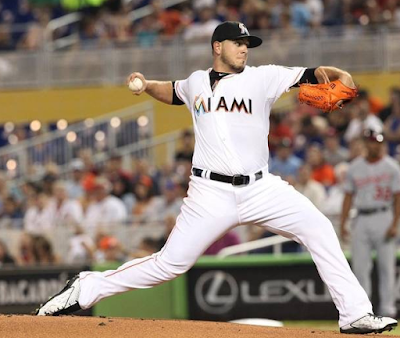 Home Uncategories Pitching mechanics: who's doing it right and who's at risk for injury? 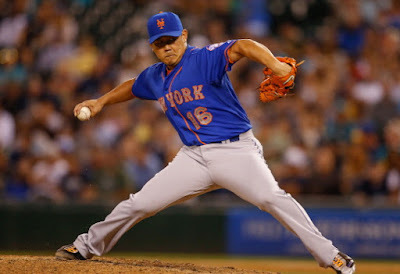 Editor's note: Guest author "FIPmyWHIP" (Ron) gives us an inside look at good and bad pitching mechanics, and identifies who's doing it right and who may be at risk for future injury. Ron has been studying and researching the "art of pitching" and reviewing video footage for the past two years. You can reach him on Twitter at @FIPmyWHIP, or via email. 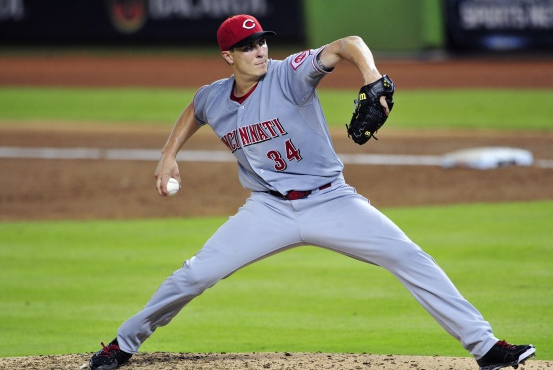 Some pitchers have good mechanics, and some don't. The ones that don't are potentially at risk for future injuries. Identifying the difference between a pitcher that has good mechanics and a pitcher that might be at risk for future injury is actually quite simple, if you look for these two keys: arm angle, and staying "behind the ball." The first key to a solid delivery is making sure that the arm is up at an angle of at least 45 degrees (or preferably greater) when the front foot strikes and the pitcher begins to rotate his shoulders. This is key because the arm angle required to initiate the throw is never less than 45 degrees. In the above photo of Justin Verlander, you can see that his arm is at angle greater than 45 degrees when his front foot plants, and his shoulders have started to rotate. 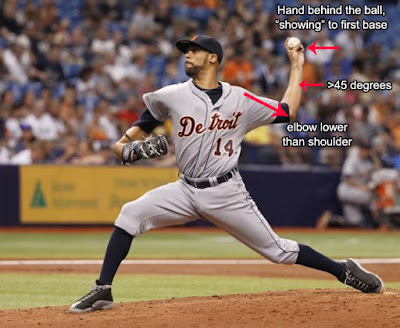 If the arm is flatter than a 45 degree angle when the foot plants and shoulders start rotating, it will cause a delay in the time it takes to get the pitching arm into the proper throwing position. 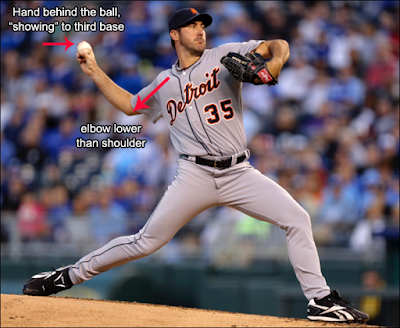 Here's a not-so-fun fact: more than half of all Tommy John surgeries are performed on pitchers whose pitching arms are not at least 45 degrees at the moment of foot strike and shoulder rotation. Jose Fernandez has already had his Tommy John surgery, and as you can see here in this picture from 2015, his arm is almost completely flat when his strike foot touches the ground. This is almost certainly to blame for his previous injuries, and may indicate that he will have other injuries to deal with in the future. The second key to a solid delivery is keeping the pitching grip "behind the ball," as opposed to "on top of the ball." 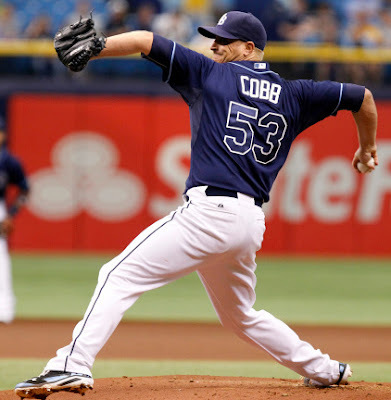 This causes the pitcher to show the white of the ball to first base (in the cast of left-handed pitchers), or to third base (in the case of right-handed pitchers). In the last decade, more and more pitchers are being taught to stay "on top of the ball" for as long as possible, and this is a troubling sign for a couple reasons. 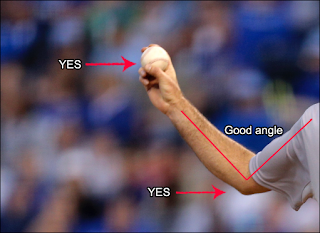 First, when the hand is on top of the ball during delivery, the ball tends to point towards second base, which puts the arm is in an internally rotated position. The problem with this is that external rotation is required to deliver the pitch, so with an internally-rotated elbow, the pitcher is effectively doubling the degrees of rotation required to get his arm into position to throw the pitch. 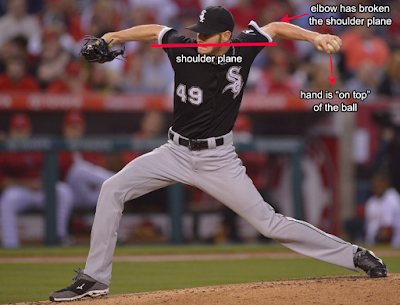 This gives a pitcher much less time to get his arm into the proper position. This photo of Shelby Miller is demonstrates perfectly what staying on top of the ball does to the overall delivery. Miller's foot has made contact, which means he's very close to initiating the pitch, yet his arm isn't close to a correct throwing position. 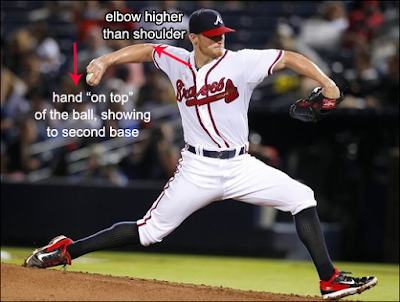 The second problem with staying on top of the ball is it often causes the elbows to rise above the shoulders through the moment of foot strike and shoulder rotation. The arm is not yet in a proper position to initiate the throw, which means the pitcher has to rush or speed up his delivery process for his arm to catch up to the rest of his body. This photo of Chris Sale shows exactly how staying on top of the ball as long as possible causes his elbows to break the plane of his shoulders through the foot strike. Sale now has to externally rotate his arm almost twice as much just to throw the pitch. By now you may have noticed a pattern. The techniques (or "cues," as they're most commonly called) are not the direct cause of the injuries. Rather, they interfere with the timing required for the arm to be in a proper throwing position. A coach's goal isn't to delay the pitcher's arm, it's to put the arm into a position where the pitcher can achieve more power and torque. In a game where velocity is king, it's not surprising pitchers are willing to do whatever it takes to make it to the big leagues and stay there, even if that means using unhealthy mechanics that can shed years off their career. Is Chris Sale is pitching on borrowed time? Yes, I believe he is. 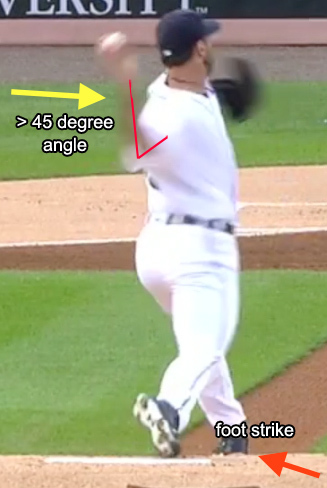 In future posts, we'll look specifically at pitchers on the Tigers roster and identify who is and who isn't using solid mechanics.